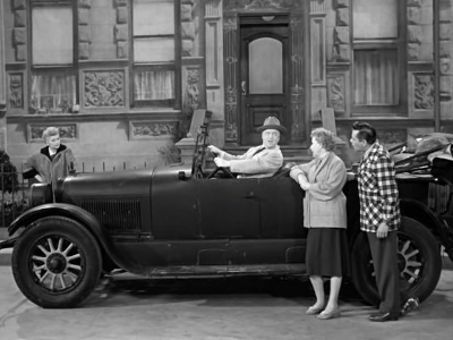 Now that Ricky (Desi Arnaz) has purchased a car for their trip to Hollywood (yes, it's the famous 1955 Pontiac convertible that has shown up in so many TV retrospectives), Lucy (Lucille Ball) insists upon learning to drive. Reluctantly, Ricky agrees to teach her, but then reneges on the deal after Lucy tries to make a U-turn in the Holland Tunnel! This doesn't stop Lucy from passing on what little she knows about driving to Ethel (Vivian Vance), resulting in not one but two crackups. But that's not the worst of it: Lucy has forgotten to purchase an insurance policy for the new car.